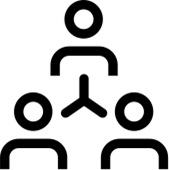 About the association | Institut Bauen und Umwelt e.V. The construction industry is dedicated to sustainable development, the essence of which is the preservation of human life and nature for future generations. Sustainability in the building sector means mastering ecological challenges while taking into account economic and social aspects. Many construction industry stakeholders who have this voluntarily taken on this responsibility are building product manufacturers and members of the Institut Bauen und Umwelt e. V. — the IBU. Its more than 200 companies and associations make the IBU the largest association of building material manufacturers, and it has devoted itself to the concept of sustainable construction. The IBU operates a cross-sector, independent information system for construction products and building components and ensures that ecological aspects are able to be incorporated into the sustainability assessment of buildings. This does not include product evaluation. The IBU is one of the leading programme operators worldwide for construction industry environmental product declarations (EPDs) and is Europe’s leading organisation for building product declarations that conform to the European standard EN 15804. On the basis of its more than 30 years of voluntary commitment, the IBU has set an industry standard that has now established itself in all areas of the entire construction industry, from products for building construction and underground engineering to building services components. The IBU began its history in 1982 with the founding of the ‘Arbeitsgemeinschaft Umweltverträgliches Bauprodukt e. V.’, or AUB. The organisation was renamed in 2008, and since 2013, the IBU home office has been located in Berlin. 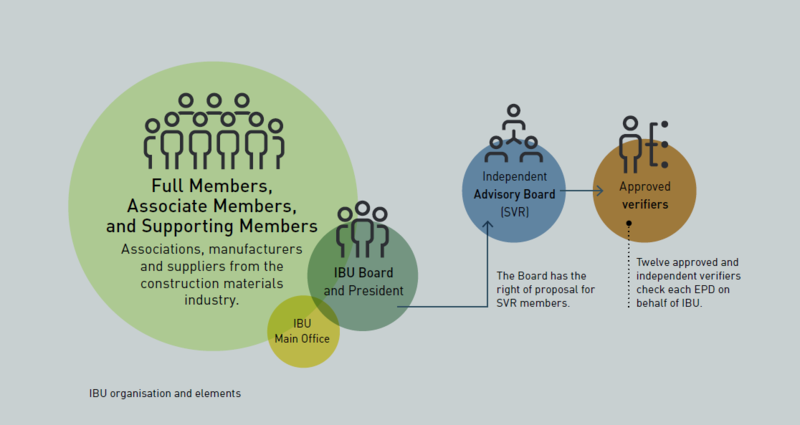 The IBU’s more than 200 members elect the fifteen-member Board and the President, who is the public representative of the IBU and who provides guidance on strategic planning. The top-level expert body is the pro bono Advisory Board, which is responsible for appointing the independent third-party verifiers. Closed systems and a waste-free economy: this is a vision that, within the concept of sustainability – which has now become a political guiding principle – is meant to become reality. The ‘three-pillar model of sustainability’ makes it clear that economics, ecology, and social factors all contribute equally to sustainable development. The concept that ecology plays an especially important role has long-since been accepted in the construction and real estate sector. In order to meet the requirements of sustainable construction and to have their buildings certified as sustainable, planners, investors, and property developers are increasingly taking environmental aspects into consideration in their choice of products. In ecological terms, sustainable construction means taking a holistic view of each building, while analysing every building component. This is because each individual building product influences the ecological performance of the entire structure. For this reason, the IBU, in cooperation with construction and environmental authorities along with international standardisation institutes, has developed an EPD programme that is used by IBU member companies as the basis for creating EPDs for their building products. They thereby provide important information for assessing the ecological quality of a building – an essential component for the holistic assessment of building sustainability. This means that IBU members, as the declaration holders, voluntarily disclose comprehensive information about their products. The IBU is thus committed to a scientifically-based analysis of construction products and building components. This goes much further than just energy efficiency or CO2 reduction. The IBU’s EPD programme provides comprehensive life cycle assessments and an independent verification process. Manufacturers and associations in the building materials and building services industry who become IBU members thereby raise their profiles. They demonstrate their commitment to sustainability. By creating EPDs, they make it clear that they are taking initiative, since the detailed life cycle assessment that precedes EPD creation reveals potential for improvements to products in terms of their environmental impact. Process optimisation potential will also be identified, allowing EPD owners to further expand their sustainability efforts and strengthen their market position. As IBU members, they benefit from the fact that the IBU and its EPD programme, especially on account of the transparency it provides, enjoy a high level of acceptance by building certification systems. At both the global and the European level, the IBU is committed to cross-border recognition of EPDs, and works in cooperation with many European and non-European EPD programme operators. As initiator and founding member of the ECO Platform, an umbrella organisation of the individual national EPD programme operators, the IBU is involved in issues such as the harmonisation of EPDs on a European level, a project that began in 2013. This consists of the development of a uniform procedure and uniform standards based on existing European standards. Through mutual recognition, IBU members also have the ability to have their EPDs published in EPD programmes in other countries, making them available them to further markets. Conversely, the IBU may also publish externally-created EPDs. Sustainability is a popular topic these days. Often, however, the term is not used selectively, or can be inflationary, or may have been added only for advertising purposes. Public reporting on sustainability is often limited to topics such as energy efficiency, CO2 reduction, or the trend towards renewable raw materials. The IBU provides information and clarification. The environmental aspects of sustainability are multi-layered and complex. The IBU’s aim is to clearly show the potential for improvement that is particularly offered by the construction sector for a more conservational approach to environmental issues and the scarcity of resources. To achieve this, the IBU carries out intensive public relations activities and participates in networks that are involved with sustainability in the construction industry and that promote sustainable development. The IBU has a broad-ranging network of experts and, in recent years, has increasingly developed into a competence centre for sustainable construction. This network includes the independent Advisory Board, whose members are experts from such areas as environmental and building authorities, construction companies, testing facilities, standardisation, science, and environmental associations. The IBU also maintains intensive exchanges with, among others, representatives of building certification systems and life cycle assessment experts. The IBU maintains dialogue with German ministries and authorities, such as the Federal Ministry for the Environment, Nature Conservation, Building and Nuclear Safety (BMUB) and the Federal Institute for Research on Building, Urban Affairs and Spatial Development (BBSR), and participates in the Sustainable Building Roundtable. This body supports the BMUB in developing regulations for the sustainable construction of federal government buildings. The findings are included in such publications as the Guidelines for Sustainable Building. The IBU is also an active member of the Resource Efficiency in Construction Roundtable, thereby helping to shape the future development of sustainable and resource-efficient construction. In its partnership with the Assessment System for Sustainable Building (BNB) for federal buildings, the IBU is an active participant in the exchange between EPD programme operators and building certification systems. The IBU is a founding member of the non-profit German Sustainable Building Council (DGNB), which operates the DGNB system for private construction projects. IBU Managing Director Burkhart Lehmann is a member of the Construction Products Council there. The IBU is also active on an international level, including its membership in the U.S. Green Building Council (USGBC) and the German Green Building Association (GGBA), and its role as the exclusive German partner of the USGBC and German offshoots of the LEED system. As an example, the IBU is providing support for the adaptation of the USGBC-issued LEED building certification system to European and German market conditions.